Learn how to make your own product samples for less than that can actually help you sell your products. Use our hack to create samples for less than $.50 a piece! Samples can be expensive when you purchase them in bulk. Learn how to inexpensively make your own samples of creams, lotions, soaps, makeup and more! Sometimes the best way to get someone "hooked" on your favorite product is for them to try it themselves. We recommend to all our Tanning Artists that they create these with our tan Extend and Face lotions to send home with Brides and top paying clients. These are perfect for the occasional touch-up. BronzedBerry provides a free printable label for our products to our members. It comes free in our 21 Day Certification Course and in our Vault. Use the links below and get started making your own samples! Want pearly whites in one hour without significant gum sensitivity? 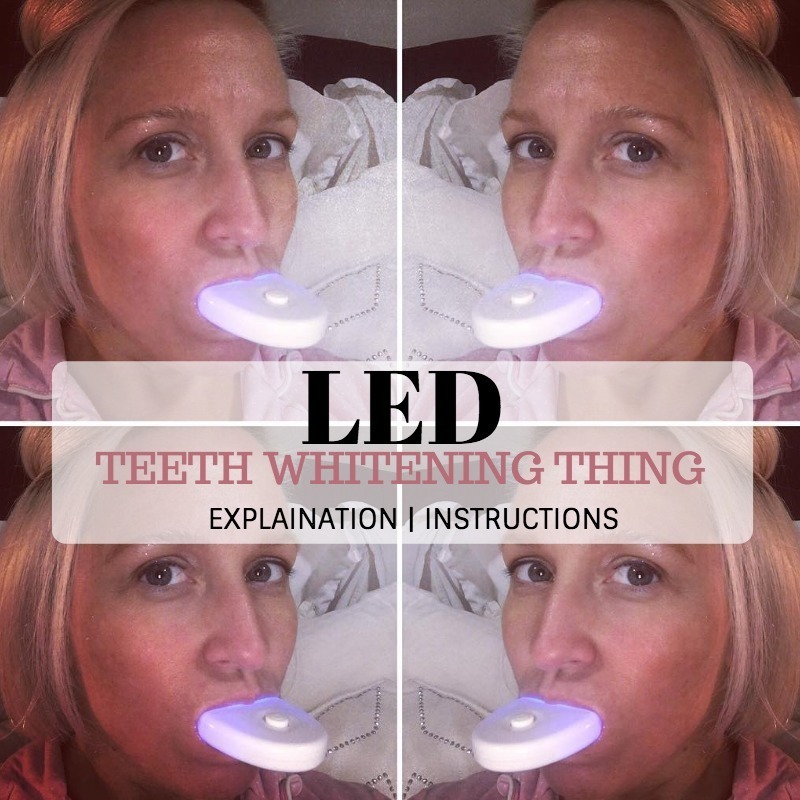 Use the tips below to get the most out of LED gel teeth whitening kits. We recently posted an article regarding teeth whitening and the latest trends. We review other options and what results you can expect from you each. Check it out here. 1. Watch The How To Video - Let us walk you through unpacking your kit and explain the items inside and how to use them. While some companies contents may vary slightly, most kits will be significantly similar. Kits will always include an LED light and gel at it's most basic level. BronzedBerry Pro-Tip: Ditch the tray. If your kit comes with a tray, avoid using it altogether (follow our video and apply the gel directly to your teeth). This will help eliminate sensitivity from the gel overlapping your gums and you'll use about the half the gel! 2. How Much Gel To Use - In each treatment you'll roughly use about 1mL of gel, but don't focus on that. Apply enough gel to completely cover your top and bottom teeth. We suggest you apply gel to all the teeth that show when you smile. Don't waste your gel by going too far back, remember it's LED light activated so if the light can't reach it, you are wasting your product. BronzedBerry Pro-Tip: Use this picture guide (below) as a reference for how much gel to apply to your teeth before a treatment. Only overlap gums slightly. 3. How Many Treatments Can I Do - Always refer to the manufacturers guide first. Most take home kits with an LED light are intended to be used in multiple treatments, each treatment lasting between 15-20 minutes. Beyond that the LED activated ingredients do not work so there is zero use in keeping it on longer. After each 20 minute session, you'll reapply the gel and begin the process over again. The higher the concentration of peroxide the stronger the bleaching agent and the more you'll need to be careful not to overdo it. We recomend NO more than 3 consecutive treatments lasting no more than 20 minutes each. If you are using a high quality gel the results will last you between 6-12 months! BronzedBerry Pro-Tip: Put gel in fridge and discard within 12 months, or less if package indicates an expiration date. Refrigeration will help keep bacteria from growing inside your gel syringe. Always discard if something smells or looks suspicious. Disclaimer: This post is NOT medical or dental advice. Seek professional guidance if you have questions about the safety of teeth whitening for your teeth or that of a minor. This is intended as a reference for kits available for purchase off the internet with 16% or less peroxide concentration. I can’t think of anyone that doesn’t want a bright white smile. Life happens (including coffee & wine) and our teeth can lose that youthful brightness. Getting it back requires the use of a product that can lift and remove the stains. There are so many options to chose from. As an avid teeth whitener myself, I’ve tried and researched them all. Most everyone is familiar with whitening strips (cost up to $80+) and kits with trays from a dentist that can cost upwards of $300. I’m focusing this article on recent trends in the teeth whitening world and analyzing the costs, claims and research. Holy cannoli, I can barely be on Facebook without seeing a picture of someone with black charcoal running down their face. 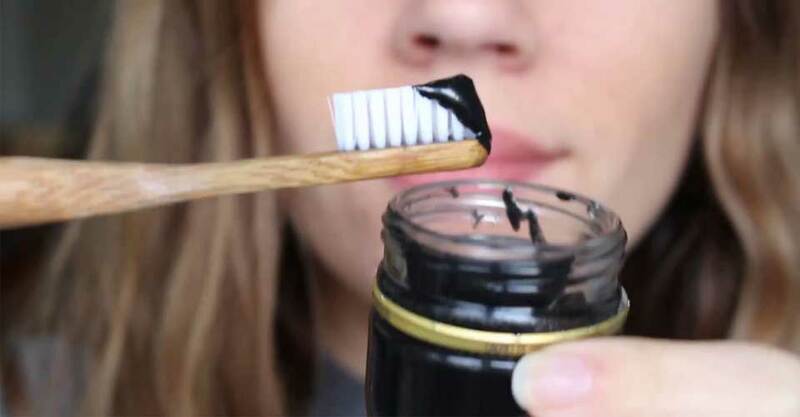 The Claim: "Charcoal will remove stains from teeth"
The Research: Activated Charcoal is amazing for many things but be cautious using this on your teeth. It can be abrasive and depending on the condition of your teeth and enamel it can cause more harm than good. It may lift temporary stains, like today's coffee, but the 'sins' of yesteryear require a bleaching agent to permanently remove stains. Charcoal toothpaste requires consistent use in order to keep any of the minimal results you could expect to receive. If this is your jam, check out this blog for comparisons and how to use charcoal toothpaste. The Problem: I'm just not into cleaning my sink out every day so making it myself out of capsules is a no go for me. The pastes themselves seem fine enough but I just don't like using abrasives on my family's teeth. I'd rather a permanent solution that is quick. If I could brush away years of stains off my teeth naturally, I'd be all about it. But recently I've been seeing claims from friends on Facebook about a toothpaste that will permentatnly remove stains, whiten teeth naturally and is gentle enough for children. But, none of their pictures included the brand name or ingredient list so I was on a mission to figure this trend out. The Research: It works temporarily, but just like the charcoal paste, it's an abrasive agent in the paste that is scrubbing away surface stains. This can be problematic for anyone who is concerned with their enamel and especially for children. Everyone needs to decide for themselves if the price is worth it, considering you have to keep using it to keep up the results, results are NOT permanent. This toothpaste is produced by multi-level marketing company, Nu-Skin. 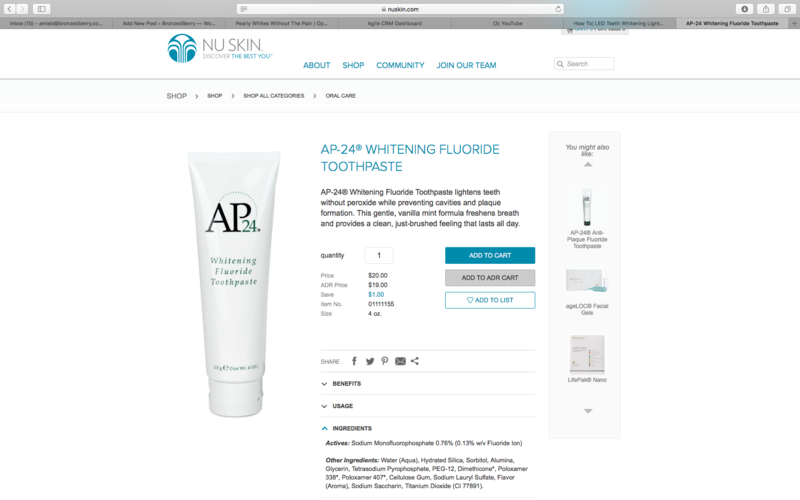 Just google Nu-Skin toothpaste complaints and you'll see a slew of info and research on this brand. 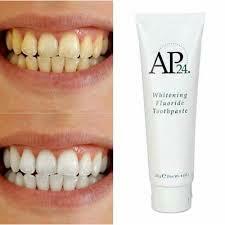 Ultimately, if the toothpaste works for you and you are willing to purchase on an ongoing basis go for it! My Problem: Nu Skin does NOT say it's natural however it's distributors often say "it's safe for kids and it's natural". My issues are not with the company, they are free to product and make whatever they want however they are still liable for what their sales people are saying. I'm hopeful they'll buckle down and educate them a bit more on the use of the word "natural" and "safe". My biggest gripe is why are the sales people not disclosing the company name and what it is? Is it a secret? If you actually look at the ingredients (click to read), there are many that are questionable for ingesting. Personally I would never let my child ingest these, especially on a regular basis! Teeth whitening, in my oppinion is something that should be done and marketed for adults and teens only, it makes me cringe to hear people advocating this to children. But, to be fair, the ingredients are not really any different then other whitening pastes on the market so if you would be comfortable using those on your kiddos then this should be no different. If the results and price are worth it to you, go for it! In choosing a whitening kit for myself I require safe ingredients, great results and a fair price. LED teeth whitening kits are all the rage and for good reason. Whiten your teeth in as little as one hour with results that last up to a year! Depending on brand these kits can even be good for those suffering from teeth sensitivity as well. The Research: These kits are availble for purchase from many companies. We found the widest rage, for our research on Amazon. Peroxide and Non-Peroxide formulas are available. Peroxide formulas achieve the best most permanent result (up to a year) by actually bleaching your teeth. Those worrying about tooth enamel erosion from abrasive toothpastes will find these kits more satisfactory. Peroxide kits are NOT recommend for children and best suited for adults. 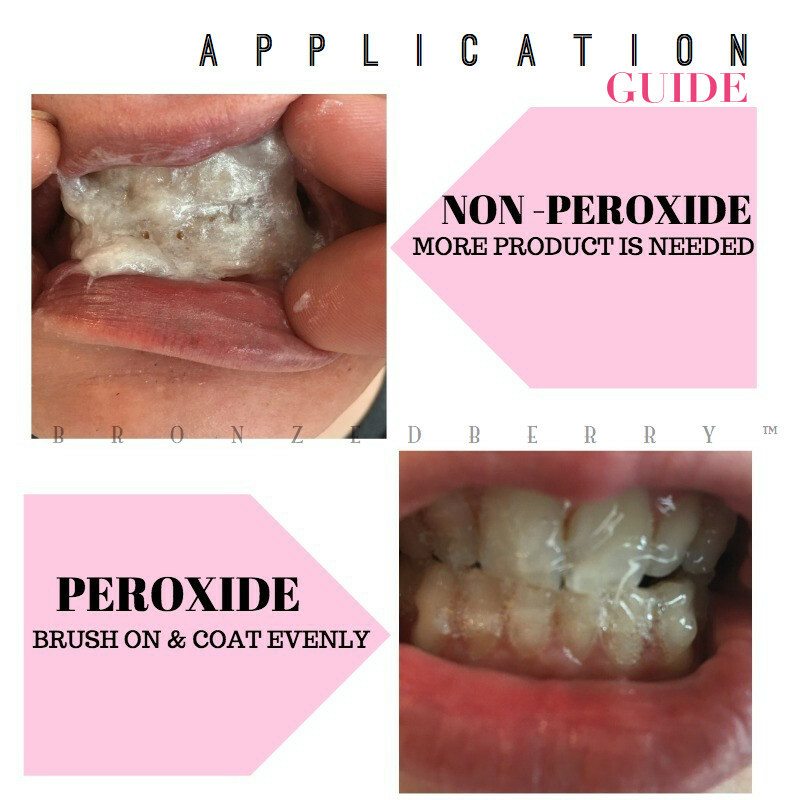 Non Peroxide kits are perfect for anyone with teeth sensitivity, the results are not as good as peroxide based gels but improvement is definitely noticeable. My Problem: Many companies provide teeth whitening trays and do not disclose the ingredients or where the gel comes from. Many gels are made in China and dropped shipped using companies like Amazon for distribution. Be careful and research each kit, find out where the gel is made and the peroxide percentage. The highest strength availble for retail sale is 16% Hydrogen Peroxide. Teeth gel trays will use up unessary amounts of gel and increase tooth sensitivity because the gel is wrapping around the back side of the teeth and surrounding the gum line. Most of tooth sensitivity can be avoided by simply not using a tray and applying the gel directly to your teeth with only a slight overlap of the gum line. Find a company whose gel is made in USA and one that you can trust and enjoy the ease of at home teeth whitening that actually works, lasts and is reasonably priced. THe fact that is can be accomplished in one hour is a total bonus and reason to buy right away! 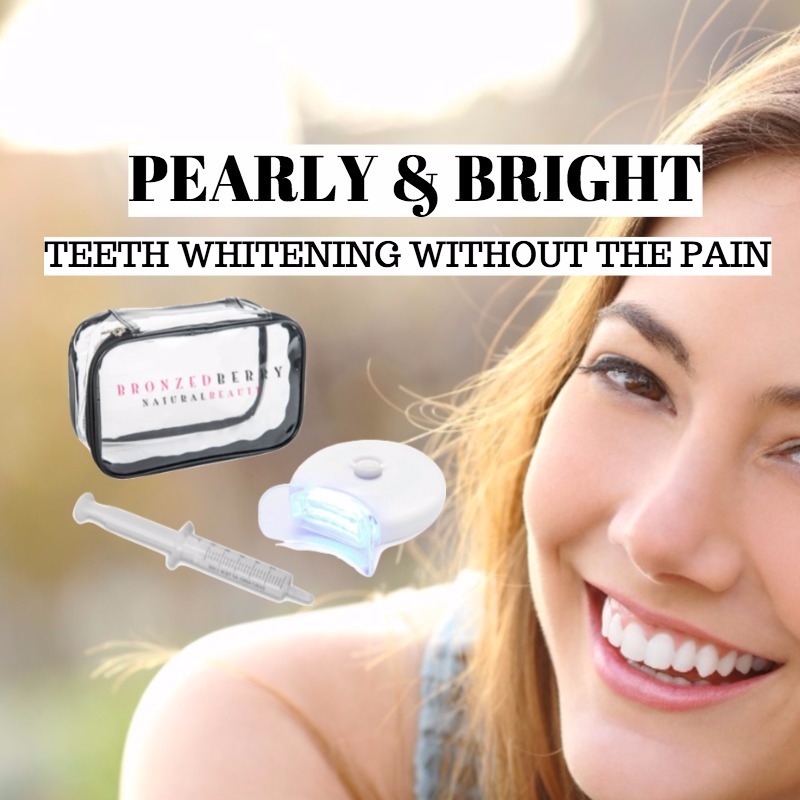 BronzedBerry is proud to offer LED Teeth Whitening Kits with 16% gel made in the USA.Our ingredients are reviews are worth a look too! Check them out here. There are some major challenges that every business owner will face, and there are some that are specific to Tanning & Makeup Artists. 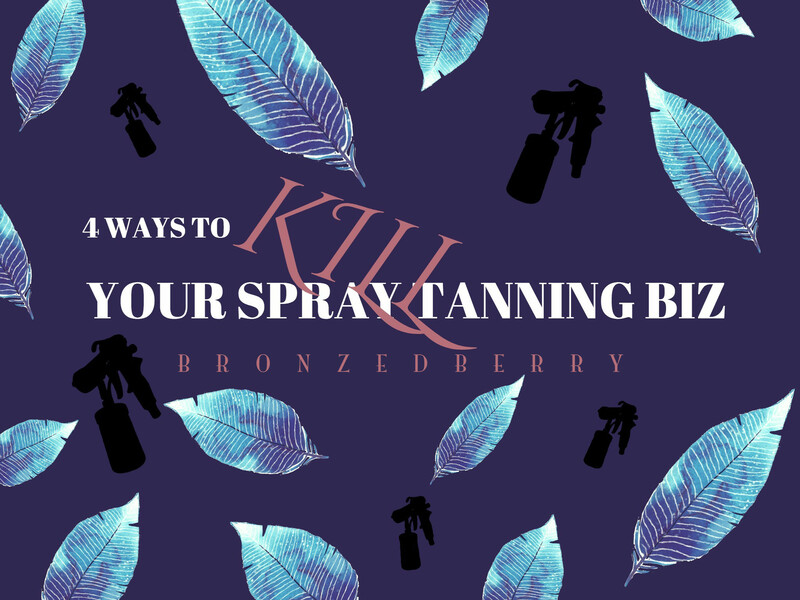 Let's walk through 4 Ways To Kill A Spray Tanning Business and what should be done instead. Providing a flawless spray tan to clients is only half the battle. Being a gifted Artist does not mean you will be a successful business owner. Pride - You don't ask for the sale and you're not putting your business ' out there' in your local market (local listings, flyers, strategic partners, salons etc). Mostly this comes from a lack of self-confidence in your business. Many college grads turned Mom think that while this business can be profitable they just don't believe it sounds "good enough". Successful Artists will laugh that all the way to the bank. Laziness - In general you're not lazy however when it comes to your business you put less than 10 hours a week into the business side of things. You've not created and carved out a specific place in your home to work on the business side. Winging It - Never treated like a real business. Never created a business plan. No clue on current profit. No 5 year business plan in place. Do you know your profit margin is? Do you even know if you've made a profit? Same Old TUNE - If your technique has not changed, if you are not offering new services (contouring, custom blending or teeth whitenning) then not only are you leaving money on the table, I guarantee you have lost some of your enthusiasm and passion too. Continuing education keeps you up to date but also ignites an authentic passion that will be hard to ignore. Do you even know what's trending in industry (strobing, contouring, flecking etc)? If any of this sounds familiar, YOU ARE NOT ALONE! Let's work on these. Get the solutions to these spray tan business killers. * This is an update from a previous Blog about killing your business. Take a peak and get even more insight, click here. It’s not easy being a Spray Tanning Artist! Watch this video and learn how NOT to fold a tanning tent. Did you see it pop right out from under him and hit the wall? That’s why we encourage and teach our Artists the proper way to fold a tent so ensure we don’t damage clients homes or office. We’re here to help! Book one our amazing Artists or become one. Not everyone has olive undertones and can pull off a dark tan, but ANYONE can get a great faux glow for their skin tone. Don’t overdo it. Prepare – Exfoliate using a moroccan harman mitt or a washcloth with your favorite soap. Don’t try a new sugar or salt scrub which can irritate your skin and leave your skin raw. Don’t use oils or lotions prior to tanning, they act as a barrier. Application – Best way to ensure a flawless application is to have a professional spray an you. However we get it, there are times when you need to DIY. If you are applying your own lotion or spray be prepared to rub it in, and then rub it in again. Continue to rub until all the product is fully absorbed to avoid streaks, then wash your hands!!!! Development Time – Read the label! If the instructions say to wash in 4 hours, then do it. The ingredient in all sunless tanners is DHA and it, by it’s nature will continue to develop up to 24 hours. The ways to stop or halt development is to wash it off. The longer you leave it on, the more it will develop. This doesn’t mean you’ll get “browner” it could mean that you’ll just get orange. Bonus Pro Tip: Depending on the concentration of the DHA will help you determine how long to leave it on. Client above had 10% solution on fair skin and left it on 12 hours. Even if you did a DIY tan, call your Artist and ask her opinion on the length of time you should leave it on. Try 8 hours and go from there. Tanning Artist Quote: We are different! Our Artists are amazing individuals who truly care about others and their families. We are so thankful for them and their commitment! BronzedBerry has given me my confidence back. I was in a 50 hour per week job that made me feel so worthless when I started this business. I met with Jackie for a tan because I was going to Florida that week with my family. I asked her about the company and I told her I was going to think about BB as a business opportunity for myself. I went on vacation and thought about it the whole time. I talked to my family and close friends about the opportunity. It was not something that I was going to take lightly. Let’s face it, most of us have gotten involved with some type of MLM and I knew that this business was different. But I still wanted to make sure that we were a good fit for each other. I prayed about it for a while and every time I did, I felt a sense of relief. I decided to sign up and give it my best and still work my regular full time job. I continued to pray about my other job since I knew that it was tearing me down emotionally. God has a way to open doors and close them. Because I decided to finish my degree at the local university, my job decided to let me go because I was no longer putting their business first in my life. I thank God and BB for the opportunity that I took last July! I don’t have that kind of stress anymore, I have a wonderful business that helps women feel good about themselves, and I can finish my degree this year! I want to be a mentor so that I can share what this business really is and help others fulfill their dream of being their own boss. I never thought that I would be where I am today and I am so grateful for the opportunities that BronzedBerry has given me. There are so many others that can enjoy this too and I would love to help them get there! Learn how to spray tan, run a business and surround yourself with other like minded women. If you want to run a spray tanning business and get a website for only $9.95 per month ( no long term commitments) then join us today. Accepting up to 15 artists monthly. If your enrollment doesn’t go through, you’ll get a message that you are in queue for the following month and we’ll let you know once a spot opens up. Clear Tanning Solution Review:Before & After from Amie Evans-Burkholder on Vimeo. 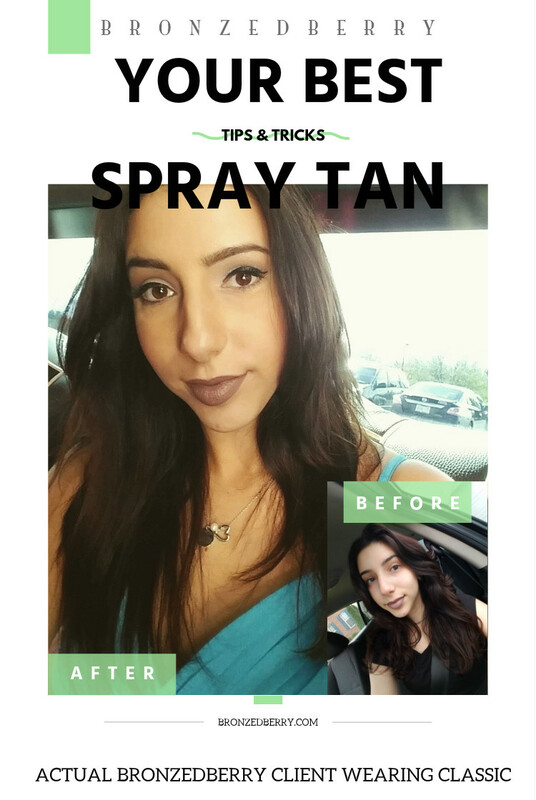 See the true results of BronzedBerry clear tanning solution before and 24 hours later. And natural looking glow with no mess and no fuss.